Contests are an incredibly effective entry point to building loyal relationships with consumers. Whether they’re hoping to win concert tickets or submitting their favorite travel photos, consumers are more inclined to connect with your brand if they’re rewarded for doing so. How to target the right customers and pinpoint where those customers spend their time. How to take advantage of each platform (and other tools that can help you make the most of them). How to craft your contest — and your prize — to attract an audience. 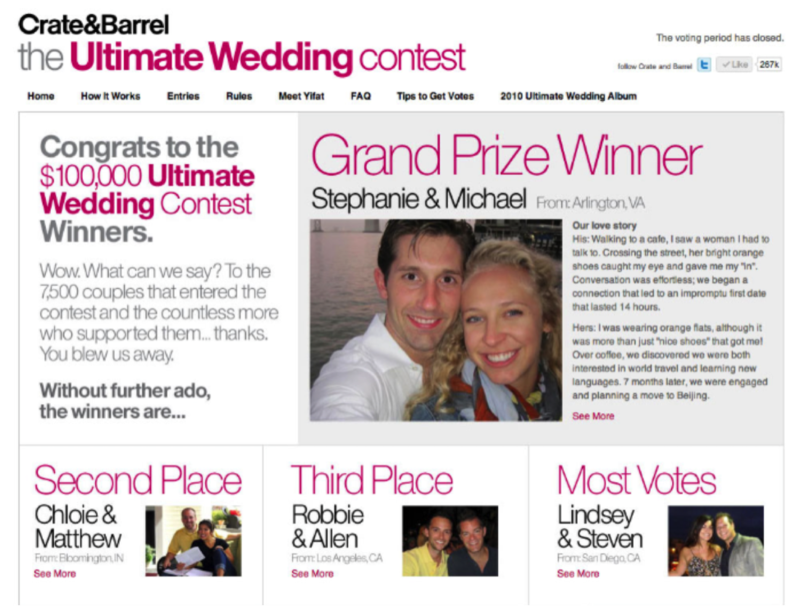 Crate & Barrel, in an effort to engage consumers online and drive gift registry creation, hosted an Ultimate Wedding Contest. It asked newly engaged couples to upload photos and share their stories for a chance to win a $100,000 dream wedding. As a result, they gained $35 million in gift registries, 16,000 entries, 500,000 votes, and more than 3 million page views. 1. Determine what success looks like. Define your goals. What do you want to get out of your contest? Do you want to drive leads, “likes,” or sales, boost engagement, or reward your existing audience? Understand your audience. Who are you trying to reach? What motivates or interests them? Where do they spend their time online? Facebook: Facebook is making it harder than ever for brands to reach and connect with fans organically — the social media platform recently changed business pages’ organic reach, ostensibly to even the playing field for small businesses. This means it may become more expensive for some brands to land on users’ News Feeds. With 1.23 billion monthly active users, however, it’s still a channel worthy of your consideration. The businesses that find the most success on Facebook are the ones that tie their contests into their customers’ personal interests and habits. But remember that you want users to engage with your brand’s offering — not just attract lots of “likes.” This concept will truly apply to marketers in the next three months, as Facebook recently announced its decision to kill business’ ability to incentivize Facebook users with a contest prize in return for a “like.” Although the news came to some marketers’ displeasure, this change will rid brands of empty Facebook fan bases — people who want a contest prize, but have no real interest in your regular services or products. Take a look at this contest from Eggo, which asked participants for their best recipes using Eggo waffles. The contest promoted the brand’s waffles through tasty-looking photos, asked users to share voting links with friends, and recommended that voters try making the recipes prior to voting — a subtle call to action to attract more buyers. Instagram: With more than 200 million users and 60 million photos uploaded daily, Instagram could be the right channel for you if you’re looking to garner unique, user-generated content. Your Instagram campaign can be as simple as asking your audience to answer a question or upload a photo with a unique hashtag. Instagram is particularly appealing for contests because all it asks of participants is that they click on images, which fuels brand awareness. To promote its “Untamed Americas” series, National Geographic Channel hosted an Instagram contest that asked fellow Instagrammers and explorers to submit photos that fit with the show’s theme. The prizes — cameras, a Glif, Nat Geo swag, and “Untamed Americas” DVDs — attracted exactly the demographic that the company wanted to engage with on Instagram. Twitter: Unlike other social channels, you can have your Twitter promo up and running in minutes; with more than 575 million users, there’s potential for large-scale success. Be sure to include a unique #hashtag and @reply to effectively monitor conversations, track entries, and communicate with your audience. Gear your efforts toward Twitter on the weekends (when engagement is 17 percent higher), make sure to use one or two hashtags (which will double your engagement), and ask for retweets (which can multiply your number of retweets up to 23 times). 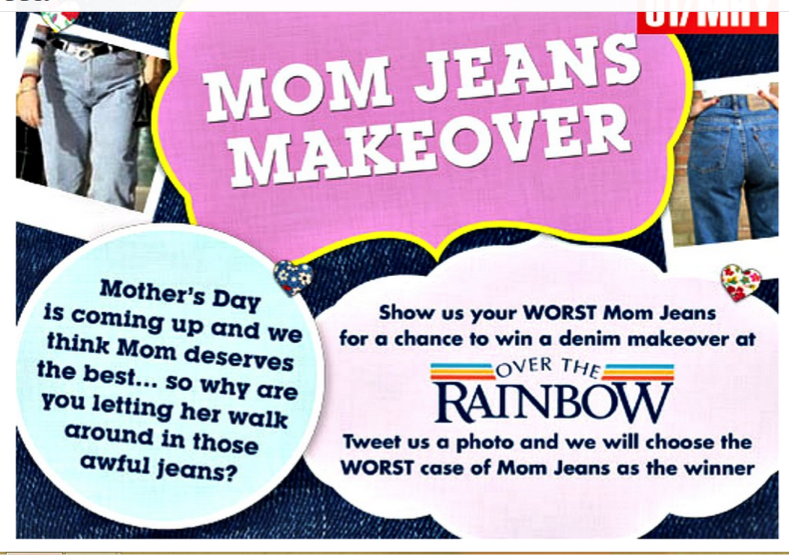 Over the Rainbow did a great job of seeking casual, funny entries for its “Mom Jeans” Twitter contest, asking followers to tweet the worst examples of Mom jeans — with the absolute worst example winning a makeover. Pinterest: Companies like Anthropologie frequently host #PinToWin contests, asking consumers to upload images and create pinboards with their favorite items from the catalog. Participants need to disclose that their boards are entries in a promotion to comply with FTC guidelines.If you’d prefer to drive traffic to your domain, a contest microsite or an iFrame promotion on your website may be your best bet. 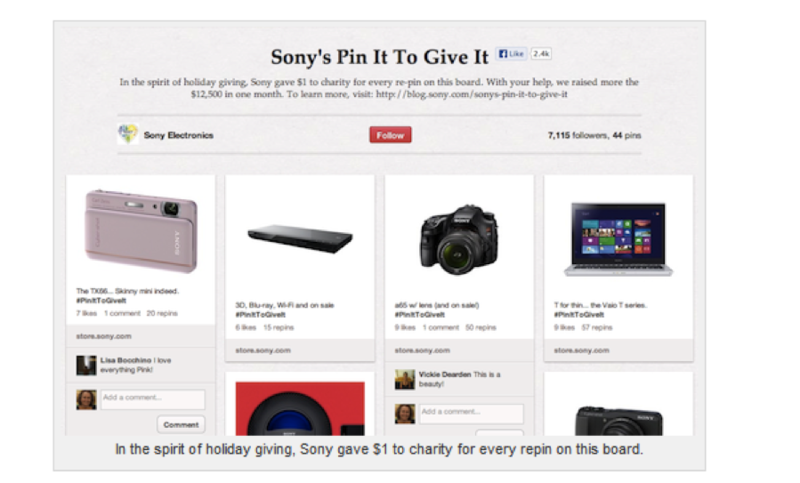 Sony did a great job of promoting its version of a “Pin It to Win It” campaign, placing a variety of its products on its “Pin It to Give It” board. Each time an item was repinned, the brand donated money to the Michael Phelps Foundation. This not only enhanced Sony’s product awareness but underscored its desire to give back, making it stand out in a sea of similarly positioned contests. 3. Use simple third-party tools. SaaS social promotions platform: The right platform will make it easy to build and share your promotion across multiple social channels as well as ensure fairness, identify brand advocates, and measure the effectiveness of your overall campaign. Google Analytics: A free tool to help you measure the success of your promotion, Google Analytics uses specific UTM codes to examine where your traffic is coming from and track your conversions. A unique hashtag: This encourages conversation and brand recognition and tracks engagement. Before launching your promotion, do a search on Twitter or hashtags.org to make sure your campaign hashtag isn’t already in use. Google AdWords, Facebook Ads, or Promoted Tweets: Once you launch, a targeted ad campaign can help raise awareness and drive traffic to your online promotion. MailChimp: Add new leads who join through your promotion to your database to stay in touch after your contest has ended and nurture these relationships in the future. Buffer and HootSuite: Social media dashboards allow you to share posts on multiple channels, track mentions, and actively participate in the conversation around your promotion. By following these three steps, you can easily create and launch a fully branded social campaign that helps grow your audience, boost engagement, and provide you with the opportunity to turn a “like” into a long-lasting relationship. How have you used contests to engage customers? The measurement tail is wagging the marketing dog … and it’s turning your marketing into a dog. Unfortunately, few marketers have the insight needed to illustrate the problem, and even fewer have the guts to take it on within their organizations. Content marketing strategy begins with an understanding of audience and context — everything from analyzing your competition, to assessing economic pressures and exploring competing priorities. Based on that understanding, you identify the opportunities or challenges marketing needs to tackle. Are you losing opportunities because of a perception problem? Are you not in the consideration set at all because of low awareness of what makes your solution different? Are you not being discovered when people look for a solution to the problems you solve? Is the problem that your product or solution addresses a challenge that has simply become accepted as a part of doing business today and is no longer seen as a source of pain? Now you should be ready to establish your strategic plan. But instead, you are going to toss everything you just did and cave to the demands of the measurement dictocrats. Here are just a few of the changes you will make. By the time you are finished, there won’t be anything left of the plan you could have created — or the difference it could have made. You will ignore the biggest opportunity you have. You could create a great article, white paper, and video that address the opportunity or challenge you identified and ensure they are broadly distributed, consumed, and discussed. For many marketers this is probably appropriate. Not so fast. You need to measure that effort and definitively tie it back to revenue. Easy enough: You add a registration form. Now you know who actually saw your content (not just how many times it was seen) and can tie future revenue back to that form completion and your marketing effort. There are just two elephant-sized problems you are overlooking: You decimated the distribution of your content and replaced your original content marketing strategy with rote lead capture. Sure, your results look OK on paper, but you are now all but ignoring the biggest challenges or opportunities you have. You will sacrifice the customer experience. Creating a great experience is critical, right? Social-sharing buttons that require authorizing a new application before sharing: Sure, you get some great data, but at what cost to the visitor experience or the social distribution of your content? Limiting RSS feeds to headlines and abstracts lets you track views of your content but increases the distance between your audience and your content. You created that content because you wanted people to see it; now you are making it more difficult. Unnecessary thank-you pages make measurement a snap but they often become a dead end, keeping visitors out of the experience you were drawing them in to. Every break point you add to the experience gives you a way to measure activity or collect additional data, but each additional step may compromise customer experience and your ultimate results. You will slowly adopt the most obnoxious marketing tactics. Strategy is not infallible, but measurement is not either. Visits, sign-ups, sales meetings, and closed deals may be in nearly every report, but you will never see a line for the number of people who screamed, “I am sick of Acme Company!” because of an aggressive appointment-setting firm you hired. You likely know to avoid aggressive telemarketing, but what about these common content missteps? Would your strategy lead you down these obnoxious and destructive roads, or just your measurement? Interruptive online ads — like the not-at-all-welcoming welcome ads major publishers sell — deliver traffic from everyone who missed that tiny Close button by just two pixels. That includes practically every mobile visitor to the site. How many of them frantically hit the back button in frustration while your landing page loads? Sensational, yet misleading, headlines increase traffic but leave your visitor feeling duped and wary of clicking again. Expanding your retargeting program: I recently saw five retargeting ads for a single company on one page, each one bought through a different provider. Measurement, not strategy, made an agency do that. Obnoxious marketing tactics look great in reports, but are they really great for your business? It is time to resurrect strategy and stop sacrificing real results for the sake of misleading numbers on a piece of paper. 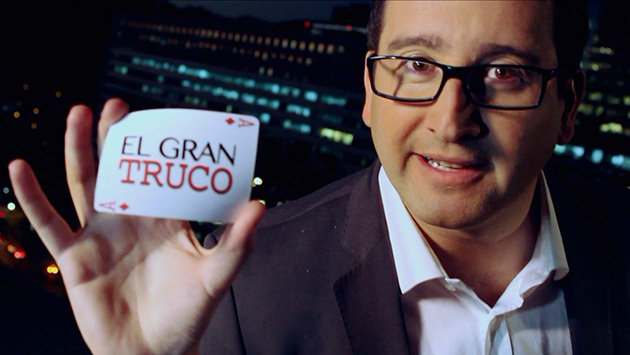 Content marketing is popular. Period. However, with popularity comes great power, a power the majority of marketers surveyed in B2B Marketing’s 2014 Content Benchmarking Report cannot seem to measure, or harness. Only one per cent of the B2B marketers that took part in the research said content has ‘limited or no importance’ in their activity. For the other 99 per cent content plays a key role in their overall marketing efforts, with 61 per cent of senior management supporting it. Due to its great popularity, inbound marketing now takes up 40 per cent of marketers’ time and 29 per cent of the department’s budget. As a result of its popularity, 86 per cent of marketers have been creating more content over the last 12 months. Impressively, this has been achieved without any notable increase in time and budget; growing just one per cent and three per cent respectively. This paints a bleak picture of marketing teams under pressure to create an abundance of content to reach targets, rather than business goals. It is unsurprising then that 84 per cent of marketers agreed ‘standing out from the crowd’ was a main challenge. 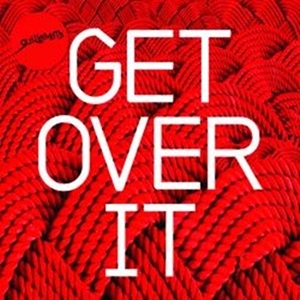 To overcome this issue 42 per cent said their teams needed to produce ‘more relevant/commercially useful content’, 19 per cent said ‘using the right platform for the audience’ would overcome the problem and 13 per cent felt creating ‘original’, ‘tailored’ content would help. This may mean producing fewer pieces of content, focusing instead on larger projects tailored to prospects’ needs and pain points. Marketers need to follow Hitel’s advice and repurpose content. For example a research report can be recycled to create an infographic, a video and a series of blogs. So, as marketing teams go into content overdrive, what formats are they focusing on? The research revealed the most popular types of content are blog posts, (frequently used by 61 per cent of marketers), followed by press releases (47 per cent) and case studies (45 per cent). However, this is in contrast with the most effective content types: video (47 per cent), case studies (46 per cent) and whitepapers (39 per cent). Going forward, it is essential marketers begin to use the best type of content for their intended goals. The report showed the best type of content to generate the most leads is whitepapers. Reports, whitepapers and case studies generate most revenue. Whereas blog posts are the best at driving traffic to websites. Creating effective content also means preparation and planning. While 68 per cent of brands have a content marketing strategy, 63 per cent of brands do not have editorial guidelines. Guidelines should address the main objectives and features of the content marketing campaign. Forty-five per cent of marketers said the key feature of a successful programme was ‘relevance to audience’, 24 per cent listed ‘engagement’ and 19 per cent said ‘appropriate channel use’. Oddly, only one per cent said creating ‘memorable content’ was a key feature of a successful campaign. This adds to the argument brands are creating an abundance of ‘one hit wonders’ when it comes to content, rather than creating useful, interesting and valuable pieces their prospects will remember and keep in mind when it’s time to buy. Creating successful content is only half the battle, ensuring it reaches the right people is the other. To do this 95 per cent of marketers use email to distribute content, followed by company website (93 per cent) and social media (91 per cent). With nearly all B2B marketers utilising these channels, brands have begun shouting messages at their customers rather than creating a two-way dialogue. In order to break through the noise and differentiate in a busy marketplace, practitioners should be looking further afield at new technologies and traditional channels that are currently less popular. For example, only 28 per cent said they distributed content via direct mail, 19 per cent via third party blogs and 17 per cent via a mobile or tablet apps. These less busy channels could be exploited. Subsequently, trying to be heard above the noise of competitors is a continuing problem in B2B, with ‘engaging target audience’ listed as the number one challenge 37 per cent of marketers are facing, followed by ‘measuring ROI’ (34 per cent) and ‘generating leads’ (29 per cent). Only three per cent of those surveyed said they could measure ROI on their content activity ‘all the time’ (an increase of a mere two per cent since 2013). While 38 per cent said they could only measure ROI ‘some of the time’, another 15 per cent admitted they could ‘rarely or not at all’ calculate ROI. It is worrying that ROI still remains a problem as 63 per cent of senior management teams prefer their marketing departments to demonstrate ROI, and a further 21 per cent have a ‘strong emphasis’ on it. All three of these challenges could be overcome by the proper implementation of analytics. While over half (55 per cent) of B2B organisations said they utilised data analytics, only 22 per cent said it played a ‘critical’ role when creating effective campaigns. Some 54 per cent of those surveyed used web analytics, 31 per cent social analytics, 27 per cent marketing automation software and 25 per cent CRM. Of the 27 per cent utilising marketing automation platforms, four per cent said they made ‘little or no use’ of the features, 57 per cent made ‘some use’ of the features, and only 17 per cent said they made ‘full use’ of the software. This shows marketers are not taking advantage of the technology available. Without setting out goals that can be measured by analytics, marketers will remain lost – creating content that is of no value. This needs to change if brands want to engage with customers, prove ROI and generate real leads. B2B Marketing’s 2014 Content Benchmarking Report proves the popularity of content is still on the rise. But it also contains a stark warning: marketers need to take full control of their content efforts to overcome the major problems that remain with engagement, ROI and leads.